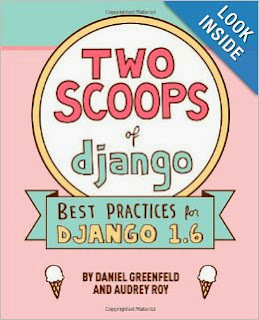 I just finished reading the book Two Scoops of Django: Best Practices For Django 1.6. I had already reviewed the previous edition, so I was anxious to see what had changed. In short, I loved it! It's not an introduction, tutorial, or a reference for Django. In fact, it assumes you've already gone through the Django tutorial, and it occasionally refers you to the Django documentation. Rather, it tells you what you should and shouldn't do to use Django effectively. It's very prescriptive, and it has strong opinions. I've always enjoyed books like that. Best of all, it's only about 400 pages long, and it's very easy to read. This edition is 100 pages longer than the previous edition, and I really enjoyed the new chapters. It has even more silly drawings and creamy ice cream analogies than the original, and even though I'm lactose intolerant, that made the book a lot of fun to read. Having read the book cover-to-cover, even though I'm fairly new to Django, I kind of feel like I know what I'm doing at this point--at least a little ;) I was afraid when I started using Django that I wouldn't have that feeling until I had used it for a couple years. So, if you're using Django, I highly recommend it!